Briton Dean Stoneman has secured a test with the Williams Formula 1 team after winning the F2 title. Ninth place at Spain's Valencia Circuit in the first of this weekend's final round of races gave him an unassailable lead over compatriot Jolyon Palmer. The Southampton 20-year-old also qualifies for the FIA superlicence that allows him to race in F1. "Getting into F1 has always been my dream, and this just brings me one step closer to that," said Stoneman. This year was Stoneman's debut in F2, which is a feeder series for F1, and he finished the season with six victories. "It's hard to know what to expect but it's obviously a fantastic opportunity to be testing a Williams Formula 1 car, so hopefully I can prove myself," added Stoneman. "I'm just going to go there and do what I do best: get in the car and drive as fast as I can." Stoneman will get his chance for Williams in the young drivers' test in Abu Dhabi at the end of the F1 season. 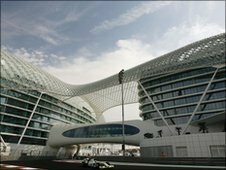 "Stoneman and Palmer have really stretched out above the rest of the field, but what we'll all really find out is what happens when Stoneman gets in a F1 car and we should see that at Abu Dhabi," said Williams technical director Sam Michael. In the 2008 Formula Renault UK series, Stoneman finished with a better record than Lewis Hamilton managed in his debut year in the competition.